Finally, finally our latest video about the Asian Monsoon Project is finished! This film really took time to finish! But then it is also different from the earlier films. It involves many more people, a specially designed animation, and specially composed music. This film, in contrast to our two previous films, takes our research a step further and explores what we are doing in the laboratory, how we perform the analyses and what they might tell us about past climatic and environmental changes. It also shows how large the project has grown in the mean time, involving many more researchers as compared to when we started five years ago. Barbara Wohlfarth is professor in geology at Stockholm University, where she is engaged in teaching and research. 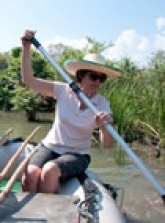 Lakes and their sediments are Barbara’s favorite topic, because these allow extracting exciting information on past climates and environments, important knowledge to better understand natural climate variability. One of her current research interests is the Asian monsoon and its variability during the past thousands of years.